First off, what is a "National Individual Investment Program"? At its most basic, a National Individual Investment Program is a means of distributing ownership of capital assets more equally among all citizens. A National Individual Investment Program would not fundamentally change anything about the American system of ownership, it would simply ensure a more equal distribution of ownership among individuals. Capital would still be privately owned the same way it is in America today, it's just that all citizens would own meaningful amounts of capital. Importantly, a National Individual Investment Program would not only ensure that individuals retained ownership of capital, it would actually reduce the roll of government in the economy by reducing the need for government-run social safety net programs. Today the richest 10% of Americans own over 80% of stock market assets, while the poorest 90% own less than 20% of stock market assets. A National Individual Investment Program like I am proposing would simply result in a much more even distribution of asset ownership, without directly changing the American economic system. Thus, after several decades of implementation, instead of the richest 10% of Americans owning 80% of stock value, the richest 10% may own 30% of stock market value, while the poorest 90% own 70% of the market. The stock market certainly does not represent the entirety of capital assets in America, but it is a large and important segment of capital assets. It is also a segment of capital assets that is relatively easy to distribute among the population due to the nature of the assets. Other forms of capital include financial securities such a bonds, direct business ownership, and commercial real estate. Of these, bonds would also be included as a part of the National Individual Investment Program since the bond market is similar to the stock market in ability to distribute the assets. Ownership of commercial real estate and private businesses (which are the majority of businesses in the country) would not be impacted by the program. The proposed National Individual Investment Program would do nothing to increase the distribution of ownership of those forms of capital, but just addressing stock and bond market ownership alone would have a significant impact on the American economy, provide greatly improved economic security for millions of Americans, and would likely have profound impacts on our democracy. How exactly would such a program work? Shares in total stock market and bond market index funds would be distributed to virtually everyone in the country on an on-going basis. The shares would be paid for via a dedicated income tax, similar to the current Social Security tax. The tax would be a defined flat tax of roughly 8% on all income, with the first $30,000 of income, and government benefits (like Social Security), being exempt. Shares would primarily be paid out based on the number of hours an individual worked, with a cap of 2,080 hours a year (40 hours a week over 52 weeks). The cap would be applied on a yearly basis so that those who work overtime in seasonal jobs would not be unduly penalized. Salaried employees would be counted as working 40 hours a week. In addition, shares would be distributed to people with disabilities (of working age), when people graduate high school, and when citizens obtain a Social Security number, which is typically when a they are born. Another consideration would be to provide benefits for stay-at-home parents as well. Under this scenario a full-time working parent, a part-time working parent or a parent with no paid job would all receive the same benefit, under certain defined conditions. Prior to turning 18 years old the shares would be held in trust and could not be accessed by you or your parents. Once you turn 18 the shares would be yours to do with as you wish and would be treated like shares in a normal mutual fund. All new shares would have a one year vesting period when they could not be sold or transferred. The national whole-market index funds would be held and managed by the federal government in order to reduce the costs of administration. The index funds would pay out a dividend based on the market, like a normal fund. Income from dividends or the sale of shares would be normal taxable events. Individuals would be allowed to transfer their shares to accounts held at private institutions if they wished once they are vested, and would be allowed to exchange them for qualifying private mutual funds, money market accounts, etc., as non-taxable events. While the administration of the program would be similar to Social Security in some ways, there would be important distinctions as well. Firstly, this would not be a retirement program. Adults would have direct access to their assets, just like any normal private investment. Secondly, individuals would actually own the assets, which is really the entire point of the program, to ensure distributed ownership of capital assets. Thirdly, and very importantly, unlike Social Security, there would never be any "trust fund" and the benefit would never be defined. The way that Social Security works is that the benefit is defined up front, and then taxes are levied in order to meet that funding obligation. This would work in the opposite way. The tax would be defined up front, and however much revenue is collected via the tax is what would get paid out. When the economy does well and collections increase, then everyone's payout would increase. When the economy does poorly and collections go down, then the payouts would go down. The program would never run either a surplus or a deficit, it would be a straight money-in-money-out program. The program is not intended to replace or diminish Social Security however. The fact that Social Security works differently is not a bad thing, it is a very good thing, which provides economic stability and diversification. Having multiple different programs that work in different ways helps to create economic stability and security under a variety of economic conditions. A program such as this would result in a far more equal distribution of financial asset ownership over the long-term, without short-term shocks to the current system. Under such a program, given the gross national income of $16 trillion in 2012, roughly $11 trillion in income would have been subject to the 8% tax, resulting in approximately $880 billion being raised by the program. If we assume a 1% administrative cost (a little more than the administrative cost of Social Security), that leaves about $870 billion which would be paid out to citizens. If we assume that 75% of the 313 million people in America would receive full benefits, that would have resulted in an average full-time worker benefit of $3,700 worth of assets in 2012. This means that a full-time fast food worker that was paid minimum wage would have paid nothing in National Individual Investment Program taxes, because their entire income was under the $30,000 exemption, but they would have received $3,700 in investment assets. At the same time a salaried CEO with a total income of $10 million would have paid $797,600 in National Individual Investment Program taxes and received the same $3,700 in benefits. This would create a break-even point of around $75,000 in total income. Full-time workers with incomes below $75,000 a year would receive more in benefits than they paid in taxes, while individuals with incomes over $75,000 would pay more in taxes than they received in benefits. The primary reason to make distribution of the shares largely contingent on working hours is to increase public support for the program by ensuring that the benefits are perceived as "earned". Provisions for other means of receiving shares, such as disability and parenting, would be important means of insuring broader distribution and inclusion of some of the most needy populations. A case could also be made to remove the work provision and simply grant the shares to all working-age adults, regardless of work status. I believe the program would have stronger public support with the work provision however. Assuming a distribution of $3,700 in 2012 for a newborn child upon receipt of their Social Security number, and a modest average annual rate of return of 5%, a child born in 2012 would have nearly $9,000 in assets in their National Individual Investment Program account upon turning 18 even if they received no additional distributions. If the average child began working part time at age 16 and graduated high school, they could easily have over $15,000 in assets by the time they graduate high school. An individual who graduated high school with $15,000 in assets and who received an average of roughly $3,000 in assets a year would have around $125,000 in assets from the program by age 40 if they never sold any of their assets, from which they would be getting around $2,500 a year in dividends assuming a modest 2% dividend. Over time, if and when the portion of national income going to capital increases and demand for labor decreases, the size of the tax could be adjusted and the number of working hours required to receive full benefits could be reduced. If demand for labor declines, then the definition of a "full time" employee should be reduced, allowing individuals to collect the maximum benefit through fewer working hours. Why would we want such a program? There are multiple reasons, ranging from the practical to the philosophical. First let's start with the practical reasons. 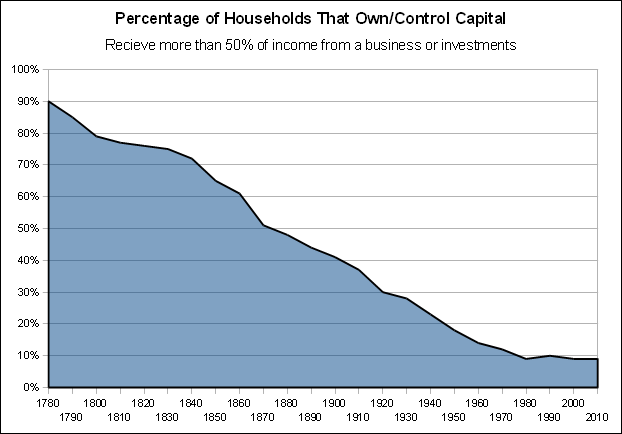 Capital ownership has become increasingly concentrated throughout American history. When the country was founded roughly 90% of citizen families owned meaningful capital from which they derived income, primarily land. Today less than 10% of American families own meaningful capital from which they derive income prior to retirement. This concentration of capital ownership is an inherent product of industrialization and capitalism, but it has also been facilitated by government policies over the years as well. As reported by the Washington Post in 2011, "Over the past 20 years, more than 80 percent of the capital gains income realized in the United States has gone to 5 percent of the people; about half of all the capital gains have gone to the wealthiest 0.1 percent." Today, despite the fact that a larger portion of the population owns investment assets such as stocks than in the past, actual capital income is increasingly going to a smaller portion of the population. There are a variety of reasons for this, ranging from tax policy to the fact that while the number of people owning at least one share of stock has increased over the years, the actual value of the assets held by the bottom 90% of the population has declined. Think of all capital income like a pie. Over the past 40 years the size of the pie slice owned by the bottom 90% of the population has shrunk, while more people among the bottom 90% are getting a piece of that slice. In other words, the slice is being shared more broadly, but everyone is getting a smaller piece. On the other hand, the slice of pie going to the top 1% has gotten larger. The other important fact that is often overlooked is the fact that over that past 100 years the portion of the population directly owning their own capital has declined at a pace that exceeds the rate of financial asset acquisition. In other words, 100 years ago a far greater portion of people owned their own business and worked for themselves or within a family owned business. The largest portion of these people were farmers who owned their own land and equipment. As small businesses were overtaken by larger corporations, more people became wage-laborers. Some of these people acquired stock or other financial assets, but the acquisition of financial assets has not offset the decline of directly owned capital assets by individuals over time. Even today, the majority of self-employed people have no meaningful capital assets. The majority of the self-employed today are primarily selling their labor, as consultants, contractors or service workers. The reality is that an ever increasing share of national income in America is going to capital, while the percentage of national income going to wages has been steadily declining from its peak after World War II. So while an increasing share of capital income has been going to the wealthiest Americans over the past several decades, the portion of national income going to capital has been increasing as well. Thus, the wealthy are getting an increasingly larger share of a growing pie, while the bottom 90% are getting a declining share of the growing capital pie, in addition to a declining share of a shrinking wage pie. There are numerous causes for this phenomenon, ranging from the off-shoring of manufacturing to trade policy to the decline of unions to tax policy to demographics to increasing automation to concentration of capital ownership and more; but ultimately the point is that wages are currently the primary means of distributing income to the majority of the population, and wages are a declining component of national income. There are essentially three groups of people who don't rely on wages as their primary source of income: retired people, those living in poverty, and the very rich. The primary sources of income for retired people are pensions, personal savings, and Social Security. The primary source of income for those living in deep poverty is transfers from the government, while those in moderate or temporary poverty may rely on a mix of wages and government transfers. The primary source of income for the very rich is capital income. Roughly 75% of the incomes of the richest 400 Americans comes from capital gains and dividends, and even without income they have significant accumulated wealth that makes the need for actual income superfluous. For example Bill Gates' current estimated wealth is $72 billion at age 58, which means that even with no new income for the rest of his life he could easily spend over $2 billion a year and not run out of money before he dies. So the issue is that virtually all households require income, and ever since industrialization wages have been the primary means of distributing income among the population. Prior to industrialization individual capital ownership and self-employment were the primary sources of income in America. Today, however, we have a situation where a growing portion of the population is dependent on wages for income, while the portion of national income going to wages is declining. This, of course, is a fundamentally unsustainable situation, and it is one that individuals can really do nothing to change. The best that any given individual can hope for is to become one of the few people who are able to acquire a large amount of capital, but fundamentally, given our current system, it is impossible for everyone, or even significant numbers of people, to do that. Our system works fundamentally like a lottery. It isn't based purely on chance like a lottery, but it is like a lottery in the sense that we have a few big "winners" with a large number of people contributing to the pool that makes those large "wins" possible, and it is impossible for everyone to "be a winner", no matter how hard everyone works or contributes. Even if the country were populated with nothing but 300 million Bill Gates clones, only a few would be rich and many would live in poverty. That is a fundamental function of our economic system. There are basically three ways to address this situation with a goal of reducing economic inequality. One is to try and increase the share of national income going to wages, thereby reducing the portion going to capital. This would presumably be done by increasing wages through things like minimum wage legislation and unionization. Another option is allow the share of income going to capital to continue to increase, but ensure that capital income is broadly distributed, thereby increasing the share of capital income going to the bottom 90% of the population. Both of those approaches address income at the source. The third option is to allow before-tax income inequality to continue to rise, but use taxation and government transfers to re-distribute that income through various programs. The conventional approaches employed in America have been to pursue the first and third options. This is basically what the New Deal did, and it did work to a large extent. The most fundamental problem with this approach, however, is that it did nothing to address the underlying concentration of capital ownership and financial power. Thus, as capital ownership continued to be consolidated the ability and desire of capital owners to undermine those approaches increased. The problem with the first and third options is that they address the symptoms of income inequality without addressing the root cause. Both of these approaches seek to alter income distributions while leaving in place the power structure that creates highly unequal income distributions to begin with. Leaving that power structure in place, concentrated ownership of capital, inevitably ensures an on-going desire and source of power to undermine any policies that seek to reduce income inequality. In addition, both the first and third approaches create friction against increasing economic efficiency. Attempting to increase total wages undermines the progress of automation, and essentially relies on preserving or increasing inefficiency as a means of distributing income. Allowing before-tax income inequality to rise and relying on government transfers to reduce income inequality after the fact has numerous inherent problems, ranging from growing bureaucratic inefficiency to the on-going political peril of any such programs as taxes would increasingly fall on a smaller and smaller portion of the population and redistribute larger and larger amounts to the rest. From a practical macro-economic standpoint, the reliance of our economy on wages as the primary means of distributing income to the majority of people is a barrier to economic growth and efficiency, and locks the population into working as a means of survival. We are reaching a point technologically where more and more work can be automated. That automation is performed by machines, which are a form of capital typically built by wage-laborers and owned by investors. This contributes to the decline of wages and the increase of capital income. But if increasing automation and efficiency results in declining wages, and as a result declining incomes for 90% to 95% of the population, then automation will inherently undermine the economy because it will decrease the wealth of the majority of the population. This means that increasing productive efficiency becomes counter productive at a macro-economic level. This condition has been predicted for a long time, over 100 years in fact. In a sense it is similar to predictions of over-population and peak oil. It is something that logically will definitely happen at some point, the issue is determining when that point will be. Just because people have been predicting that it will happen "soon" for a long time without it happening doesn't mean that it will never happen, just as, logically, the earth will run out of naturally occurring oil at some point. People who thought it would happen in the 1990s were wrong, we didn't run out of oil or even hit peak oil in the 1990s, but inevitably it will happen some time. The same issue exists with production efficiency and "job creation". While it's true that increasing efficiency during the early part of the industrial revolution resulted in net increases in worker demand, there is some point at which automation and increasing efficiency will result in net decreases in worker demand. Whether we are at that point now or not doesn't change the fact that we should be preparing the economy for this eventuality. The other major cause of decreasing domestic labor demand is off-shoring. Distributing capital ownership relatively equally among the domestic population protects the domestic economy from the effects of both automation and off-shoring. A more equal distribution of capital ownership ensures that increases in economic efficiency benefit the entire population, and thus the overall economy. In other words, once individuals actually own capital, the dependence upon government programs and labor laws is diminished. The reason that we need wage laws and income assistance programs today is that a tiny fraction of the population owns almost all of the capital, and the vast majority of people are disenfranchised of capital ownership. This dichotomy is what creates the need for all of these other mechanisms which attempt to rectify the economic problems caused by highly unequal capital ownership. The reason why there has been an increased need for these types of programs and regulations over the decades is because ownership of capital has become increasingly concentrated. 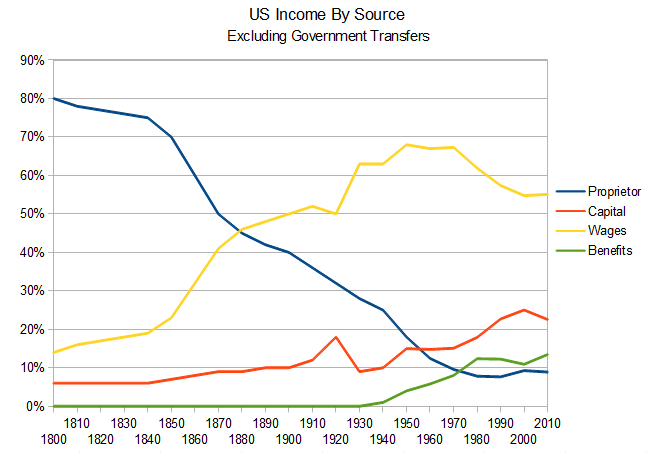 But instead of trying to maintain or increase labor's share of income, as has been the traditional approach of the labor movement in Western countries since the industrial revolution, we should instead be trying to increase the working class' share of capital ownership, and allowing the share of income going to labor to decline, as depicted below. Not only does the concentration of capital ownership create economic problems in terms of income distribution, but it is also the root source of disproportionate political power which undermines democracy, and further thwarts economic reforms. This is why the New Deal has ultimately failed, because it sought to address the issue of income distribution without addressing the issue of capital ownership distribution. Thus the New Deal did not address the concentration of political power that resulted from concentrated capital ownership, which has ultimately been used to undermine the New Deal reforms. Under New Deal type policies, economic fairness and moderated income inequality exist only at the discretion of the law. When capital ownership is distributed then economic fairness and moderated income inequality are inherent qualities of the system. Right now, because of highly unequal capital ownership, the economic system is inherently highly unequal, and we implement laws that attempt to rectify the inequalities caused by highly unequal capital ownership. These polices are always in peril because they can exist only at the discretion of the capital owners, who have disproportionate political power. That's why capital ownership itself must be highly distributed, so that the political power that comes from capital ownership is also highly distributed instead of remaining concentrated, as it did under New Deal era policies. The distribution of capital ownership to the broad population, as was originally done when America was founded through land distribution policies, is what will ultimately protect the economic interests of the broad population. Not only does distributing capital ownership ensure distributed capital income, but it also ensures the distribution of political power necessary to preserve that distribution of income. That's why the New Deal failed, because it did not ensure the distribution of political power necessary to protect "itself". This is also why the various "Communist" revolutions of the 20th century resulted in abuse of power and repressive systems, because those revolutions too resulted in concentration of capital ownership in the hands of the state. This is what makes highly distributed ownership of capital among the citizens so important. Ownership of capital is the source of political power; distributed capital ownership results in distributed political power. The distribution of political and economic power that resulted from America's early land distribution policies was a critical factor in America's early political and economic success. Not only does increasing the distribution of capital ownership, thereby increasing the distribution of capital income, make sense from a practical perspective, it makes just as much sense from a philosophical perspective. To understand some of the philosophical justifications for this type of capital distribution we can go back to the Enlightenment thinkers whose ideas laid the foundation for America's political and economic systems. We first have to begin with the fundamental concept of "private property". While there are many positive aspects to the concept of private property, such as ensuring that individuals reap the benefits of value that they create, there are negative aspects of private property as well. We first have to understand that "private property" is a social construct, it isn't natural. The existence of private property is predicated on social agreement. Naturally, everything is common property, i.e. belongs to no one / everyone. In 1690 John Locke famously laid out the philosophical justification for private property, in his argument against the existing aristocratic system of royal property ownership, in his Second Treatise on Civil Government. Though the earth and all inferior creatures be common to all men, yet every man has a "property" in his own "person." This nobody has any right to but himself. The "labour" of his body and the "work" of his hands, we may say, are properly his. Whatsoever, then, he removes out of the state that Nature hath provided and left it in, he hath mixed his labour with it, and joined to it something that is his own, and thereby makes it his property. It being by him removed from the common state Nature placed it in, it hath by this labour something annexed to it that excludes the common right of other men. For this "labour" being the unquestionable property of the labourer, no man but he can have a right to what that is once joined to, at least where there is enough, and as good left in common for others. In all of Locke's discussion on private property, he deals solely with the creation of private property from public property, or "non-property". Everything that Locke talks about regarding property in his Second Treaties deals with an individual applying their labor to unclaimed resources, and how the application of their labor justifies defining the objects that their labor is applied to as their private property. While I think virtually everyone would agree with Locke's arguments, they are unfortunately too simplistic. Locke also notes that these rules should only apply when "there is enough" and there is property "left in common for others". These are hugely important caveats, which Locke unfortunately doesn't go on to significantly address. What do we do when there isn't "enough" and there is no property "left in common for others"? Locke doesn't make it clear, but he does make it clear that at the very least, the rules of private property that he laid out shouldn't apply. Unfortunately, almost everyone today thinks about private property in the terms that John Locke laid out, but fails to deal with all of the ways that reality violates the principles laid out by Locke. This leads to a belief that the property that people own is all acquired via the methods laid out by Locke, when in fact almost no property is acquired that way in modern societies. Thus much, perhaps even most, private property ownership in modern societies is not justifiable according to Locke's principles. This is because there is very little property "left in common". Private property ownership creates a paradox, which Locke did not address. While defining private property apart from common property upon the application of one's labor is eminently justifiable, once that private property is defined it now inherently disenfranchises others. Locke dealt with this fact via his simple caveat that the rules of private property should only apply when there is "good left in common for others". As long as there is plenty of property left in common for other people to acquire then the paradox of private property is unimportant, but as soon as there is not sufficient property left in common then it is a problem. Let's use some examples. Let's say that a group of people settle an area, and the first settler there finds a waterfall and quickly sets about clearing the land around it and building a mill on the site. By the application of his labor, this person has acquired this land as their private property. But, in so doing, they now inherently prevent everyone else from having the opportunity to make use of that property. If there is only one waterfall in the area, then only one mill can be built. So the waterfall and the mill are now owned by this one individual, and that individual now decides to not perform any more labor, but instead hires people to work at the mill. What now of Locke's statement that property is defined by the application of an individual's labor? Now the owner of the mill no longer performs labor, and all of the labor is being performed by other people who don't own the property they are applying their labor to. They are working at the mill, producing grain, but they don't own the mill or the grain, and thus end up not owning any of the product of their labor. In capitalist systems, property ownership trumps labor, such that the lineage of ownership descends from property ownership, not from labor. We agree that people should be able to keep the fruits of their own labor, but as soon as private property is established, it then prevents others from being able to keep the fruits of their own labor. People can only keep the fruits of their own labor when they labor upon "common property" or upon their own property. When anyone labors upon someone else's "private property", they inherently cannot keep the fruits of their own labor. The fact that people choose to work at the mill is a de-facto result of the monopolization of resources inherent in the creation of private property. Because the mill may be the most efficient means of creating value in the community, the opportunity cost of working at the mill becomes more advantageous than working independently on less efficient property. What this does is create "voluntary" exploitation. This is because keeping 100% of what your labor produces as an individual working inefficiently can be less advantageous than keeping less than the full value of what you produce working more efficiently. Thus, the creation of efficient value generating property effectively forces individuals into exploitation. Consider that in the community there are no other places to build a water driven mill. Imagine that the only thing to be done is create grain. An individual can either make their own mill that is powered by, say, horses or their own human power, or they can work at the water mill. Let's say that they make their own mill driven by horses, and that they are able to produce $500 worth of grain a week using their own mill, but if they were to work at the water driven mill they could get paid $700 a week. However, though they would be getting paid $700 a week, more than they could earn on their own, they would actually be producing $2,000 worth of grain a week. So, they can make $2,000 worth of grain at the water mill owned by someone else, and keep $700 of it, or they can make $500 worth of grain on their own and keep 100% of it. Because the next best alternative is still worse than exploitation, this drives the voluntary exploitation. This situation exists because of private property rights, but it is a paradoxical situation, because not allowing individuals to establish private capital is problematic as well. The reason that this economic issue has been so contentious and hard to address for so long is because it is a paradox that's hard to deal with. This isn't an easy problem to solve. It is clear that today in all modern societies there is not a large reserve of common property from which individuals can acquire private property simply by the application of their labor, as was the case in early America. Today most property is already private property, and thus, Locke's principles of private property ownership are violated due to his caveat that the creation of private property is only legitimate when there is enough left in common for others, i.e. when everyone is capable of acquiring private property merely by the application of their labor. That clearly is not true today because the vast majority of people in all modern economies exercise their labor upon property which is owned by other people. So what can be done about this? Well, this situation was addressed in 1795 by Thomas Paine, a leading voice of the American Revolution. Civilization, therefore, or that which is so-called, has operated two ways: to make one part of society more affluent, and the other more wretched, than would have been the lot of either in a natural state. It is a position not to be controverted that the earth, in its natural, [un]cultivated state was, and ever would have continued to be, the common property of the human race. In that state every man would have been born to property. He would have been a joint life proprietor with rest in the property of the soil, and in all its natural productions, vegetable and animal. Every proprietor, therefore, of cultivated lands, owes to the community ground-rent (for I know of no better term to express the idea) for the land which he holds; and it is from this ground-rent that the fund prod in this plan is to issue. To create a national fund, out of which there shall be paid to every person, when arrived at the age of twenty-one years, the sum of fifteen pounds sterling, as a compensation in part, for the loss of his or her natural inheritance, by the introduction of the system of landed property. And also, the sum of ten pounds per annum, during life, to every person now living, of the age of fifty years, and to all others as they shall arrive at that age. It is proposed that the payments, as already stated, be made to every person, rich or poor. It is best to make it so, to prevent invidious distinctions. It is also right it should be so, because it is in lieu of the natural inheritance, which, as a right, belongs to every man, over and above property he may have created, or inherited from those who did. What Paine is basically saying is that in the "natural state", prior to the establishment of property rights, everyone had equal access to the land. The establishment of property rights then inherently dispossessed some people without any compensation. And now, people are born into a system in which they are dispossessed, in which they are essentially born with less access to property than if civilization didn't exist at all. Thus, Paine argues, such people have a right to the value which has been taken away from them, i.e. that we all have a natural right to use of the land, since the land was not create by anyone, but being born into a system where all land is already owned by others inherently deprives people of this natural right. Thus, people born into such a system are owed compensation for this loss. Viewed as such, this compensation is a right, not a charity, because this is compensation for something that has been taken away from them. 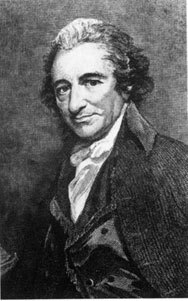 Paine then goes on to say that the best way to implement such a system is simply to make equal payments to everyone, so as to avoid complication and bickering. Paine's case obviously applies specifically to land, but the principles can be more broadly applied. In essence, the creation of all capital is a double-edged sword. On the one hand development of capital increases overall productivity and can lead to net improvements in quality of life. On the other hand, development of capital can, and often does, displace workers and decrease the value of some individuals' labor. People deserve compensation for these losses, because the ability to profit from their own labor is being taken away from them. I argue that people have a natural right to the value of their own labor, and that people therefore deserve an indemnification for the loss of their labor value due to the development of capital. This indemnification should come in the form of capital ownership. We can now turn to Thomas Jefferson, one of the most influential and important Founding Fathers. 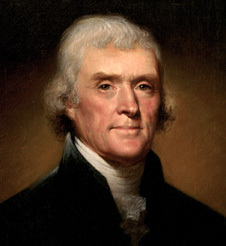 Jefferson was a strong advocate of democracy and distribution of political power. In fact Jeffersonian-Democracy is described as highly egalitarian system where political and economic power is securely in the hands of the "common people". This egalitarian ideal was pervasive in all of Jefferson's ideas about government, economics, and domestic policy. Jefferson knew that egalitarian democracy required highly distributed ownership of capital. This is why Jefferson was an advocate of family farming and opposed to the development of large scale manufacturing and corporations. I think our governments will remain virtuous for many centuries; as long as they are chiefly agricultural; and this will be as long as there shall be vacant lands in any part of America. When they get piled upon one another in large cities, as in Europe, they will become corrupt as in Europe. It ends, as might have been expected, in the ruin of its people, but this ruin will fall heaviest, as it ought to fall on that hereditary aristocracy which has for generations been preparing the catastrophe. I hope we shall take warning from the example and crush in it’s birth the aristocracy of our monied corporations which dare already to challenge our government to a trial of strength and bid defiance to the laws of our country. The property of [France] is absolutely concentered in a very few hands, having revenues of from half a million of guineas a year downwards. ... But after all these comes the most numerous of all the classes, that is, the poor who cannot find work. I asked myself what could be the reason that so many should be permitted to beg who are willing to work, in a country where there is a very considerable proportion of uncultivated lands? ... It should seem then that it must be because of the enormous wealth of the proprietors which places them above attention to the increase of their revenues by permitting these lands to be laboured. ... Another means of silently lessening the inequality of property is to exempt all from taxation below a certain point, and to tax the higher portions of property in geometrical progression as they rise. Whenever there is in any country, uncultivated lands and unemployed poor, it is clear that the laws of property have been so far extended as to violate natural right. The earth is given as a common stock for man to labour and live on. If, for the encouragement of industry we allow it to be appropriated, we must take care that other employment be furnished to those excluded from the appropriation. If we do not the fundamental right to labour the earth returns to the unemployed. It is too soon yet in our country to say that every man who cannot find employment but who can find uncultivated land, shall be at liberty to cultivate it, paying a moderate rent. But it is not too soon to provide by every possible means that as few as possible shall be without a little portion of land. The small landholders are the most precious part of a state. The reason that Jefferson associated farming with democracy was that it was relatively easy to ensure an egalitarian distribution of property in the form of land in America, and family farmers, by owning their own capital, worked for themselves. Jefferson opposed cities and corporations, because he knew that in cities many people were unable to own their own capital and work for themselves. Jefferson believed that under such circumstances workers would become dependent upon corporations and employers and lose their political independence. Jefferson was deeply opposed to hierarchical systems, which was why he opposed both corporations and a strong central government, believing that a strong central government would end up primarily serving the interests of a wealthy aristocracy. However, Jefferson ultimately knew that America couldn't remain an agricultural society forever and that eventually the land would run out and it would no longer be possible for everyone to be a farmer. However, he never really addressed how to deal with this fact, he merely hoped that the industrialization and urbanization of America would be held off as long as possible. Jefferson understood how to distribute political and economic power within an agricultural framework, but there was no model for distributed political and economic power within an industrial framework. As far as Jefferson was concerned, the development of industry and banking would inevitably lead to the development of economic inequality, aristocracy, and plutocracy. On the other hand, Jefferson was no "conservative" either. He was a liberal in the true sense, and was a strong advocate of a liberal public education and technological modernization. Jefferson hoped that science and technology could be developed in ways to make home-based manufacturing and modernization possible. Jefferson basically envisioned a nation where everyone owned their own land and was highly self-sufficient, with home-based production of commodities using machines so that automation and mechanization would enable individuals to remain independent from corporations and centralized industry. As we know, this is not at all how things turned out. But ultimately, Jefferson's key concept was that democracy was inherently dependent upon highly distributed capital ownership. In Jefferson's mind, that meant an agricultural economy where land was relatively equally divided up among everyone. What is obvious today is that this isn't possible. Modern society can't exist within the framework of a family farming nation. But, the reason that Paine, Jefferson and may others of their time focused on land distribution was because at that time land was far and away the most important form of capital and wealth. Today that is no longer the case. Jefferson's core concepts were essentially correct. Democracy is dependent upon highly distributed capital ownership. Corporations and banking do inherently lead to the development of hierarchical systems that both create economic inequality and undermine democracy. The challenge then is, how do we have both a modern industrial economy and highly distributed capital ownership? In Jefferson's mind that required direct ownership of actual physical capital in the form of land. The reason that Jefferson's vision failed is that it was dependent upon distributed land ownership, but there was no mechanism in place to ensure continued distribution of capital ownership as freely available land inevitably disappeared and land became less important after the industrial revolution. Thus, we have to do the best that we can given the requirements of a modern economy, and that means distributing ownership of corporations and financial instruments via shares. There has been growing interest in the use of a universal basic income (UBI) as a means of addressing economic inequality and poverty in developed economies; see examples here and here. Advocates of a universal basic income see it as a way to address rising income inequality and alleviate poverty. A universal basic income could address both poverty and income inequality, but in my option something like the National Individual Investment Program (NIIP) I am proposing has several significant advantages over a universal basic income. I think the most important advantage of the NIIP over a UBI is the fact that the NIIP would actually re-distribute capital, and thus truly alter before tax income distributions as well as truly altering the distribution of political power in society. A UBI does not do these things. Ultimately, a UBI becomes an allowance provided by the rich. As such, it suffers the same long-term problems as many of the New Deal era economic reforms. It can only exist at the whim of the wealthy, who, through their retained ownership of capital, would still have the political, social, cultural, and economic power to undermine the program. Even if such a program were to be implemented, it's long-term maintenance would be forever in peril, in much the same way that Social Security is today, except it would be much worse, because it would be impossible to implement a UBI without raising significant taxes on the rich, unlike Social Security, which basically doesn't tax the rich at all. Another advantage of the NIIP is that it can be supported and be meaningful with a much lower tax rate. It is basically a much more affordable approach than trying to provide a basic cash income. Most estimates for a UBI program in the United States today agree that such a program would need to provide about $10,000 a year to every adult. To reach this $10,000 level would essentially require about a 10% tax on all income, with no exemptions. This would be unaffordable currently, but some advocates for a UBI propose supporting the program by cutting existing programs, such as food stamps, housing assistance, and even Medicaid and Social Security. In such cases, a UBI could actually leave many people worse off than they are today, or at best their position would be little changed. In this case, a UBI wouldn't really do much of anything to address income inequality or alleviate poverty, it would just be a means of consolidating many different income assistance programs into a single program. This would certainly reduce the administrative costs of income assistance, but such proposals aren't really about fundamentally changing the economic and social dynamic. Because the NIIP that I propose does not give people cash, but instead provides people with an investment, it can actually provide more economic security at a lower cost. That's what makes it more affordable. Funding a UBI requires funding the full benefit with taxation, but with the NIIP, much of the benefit would come from appreciation of the assets over time as well as dividends, so those are benefits that don't have to come from taxation. In addition, because it's an investment most people would very likely leave at least some of the benefit in "savings", i.e. in their account, without cashing it out as soon as possible and spending it. This means that as a financial buffer, or safety net, it would almost certainly provide much stronger financial protection. It would not be difficult for an individual to amass $20,000 - $50,000 in NIIP assets by age 30 even while selling off some assets from time to time. If they then have a major financial emergency they would have those resources to draw on. One can argue that if people took the money from their UBI payments and invested them then it would be the same, which is essentially true, but since those benefits come in the form of cash they would be much more likely to just spend it, especially if it replaced existing poverty assistance programs, and it would also require more investment savvy from the public. But again, the most important difference between the two types of programs is that the NIIP is designed to actually re-distribute capital ownership. Doing this actually enfranchises people, whereas a UBI does not. 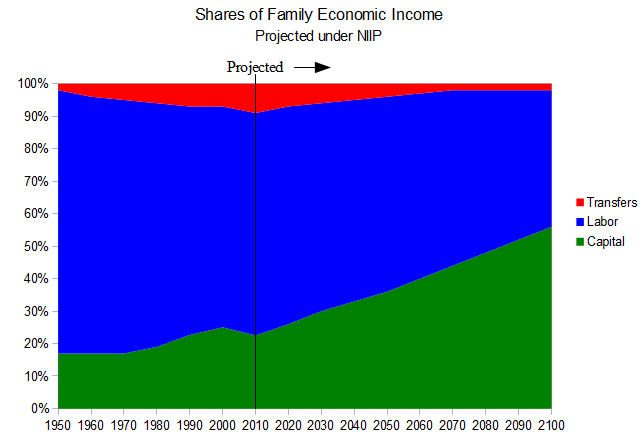 The NIIP creates a sense of ownership and I think would be viewed much differently than a UBI. A UBI would be seen as charity provided by the rich, whereas the NIIP would be seen as earned. A UBI is a mechanism for again trying to treat the consequences of concentrated capital ownership while doing nothing to actually change the concentration of capital ownership. The NIIP is a mechanism to directly address the concentration of capital ownership, recognizing that concentrated capital ownership is the root cause of economic inequality in the first place. The NIIP would be much more affordable, while likely having much more far reaching effects on the economy and society than a UBI. The primary root cause of extreme economic inequality in America and other capitalist countries is concentration of capital ownership. This concentration of capital ownership is an inherent product of capitalism and has in some ways been exacerbated by government policies that cater to the interests of the wealthy and business owners. Unfortunately this has often led to an adversarial relationship between labor and capital, whereby the interests of workers are pitted against the interests of capital owners. When a small portion of the population owns and controls the majority of the capital and the majority of the population has no meaningful capital wealth or income, then this type of adversarial relationship is inevitable, because in fact the interests of capital owners are in opposition to the interests of wage-laborers. Historically the conflict of interests between capital owners and wage-laborers has been addressed in capitalist countries by trying to either increase the share of revenue that is paid to wage-laborers or to use redistributive taxation to address the most basic needs of non-capital owners through government programs, such as food and housing assistance. The problem with these approaches is that they fail to actually enfranchise the working class and they in fact actually facilitate further concentration of capital ownership. Another problem with this approach is that it is in conflict with the efficient development of capital. It leads to the all-too-common refrain that we hear today of calls for "job creation". But the objective of an economy is not to create jobs, it is to create wealth. Jobs are merely a means to that end, they are not the goal in and of itself. The problem is that for the vast majority of the population wages, i.e. jobs, are the only means of distributing income. What people really needed however, is not a "job", but rather an income. No one needs a job, but everyone needs an income. What we have is a system where the incomes of the vast majority of the population are dependent upon wages, i.e. holding a job, and the incomes of a small minority of the population are a product of capital ownership. The solution to this problem is not to try and increase the portion of revenues going to wages, but rather to increase the distribution of capital income, so that increases in capital development and capital income benefit everyone and everyone can become less dependent on wages, just as the wealthy are today. The problem with the current American economy is that it is too "job bound". The economy is too dependent on jobs as a mechanism for income distribution, despite the fact that a growing share of income is actually going to capital. The income distribution mechanism is out of sync with the mechanisms of creating wealth. Wealth is increasingly created by machines, not human labor, but a shrinking share of the population owns and controls the machines that create the wealth. Yet, it is a fact that the wealth of the capital owners is only made possible by the labor and existence of non-capital owners. The solution clearly is more broadly shared capital ownership. It is an obvious solution that has been known for a long time. That's what the communist and socialist movements of the 19th and 20th century were all about, but the National Individual Investment Program is a different approach, that is actually much simpler and in line with American society and traditions. The communist and socialist movements essentially sought to abolish private capital ownership, but the National Individual Investment Program seeks merely to make everyone meaningful private capital owners. It is not a silver bullet. It won't solve all of the problems of economic inequality, and the program as I have proposed it certainly won't put an end to poverty, but that's actually the beauty of it. What I'm proposing isn't actually that radical; in fact it's not very different from some conservative proposals for the privatization of Social Security. What I'm proposing is an independent program, that can be implemented all by itself. It doesn't require any radical transformation of the economy or restructuring of other programs or an overhaul of the tax code, etc. Many of those things would be nice, and a lot could be done to improve the economy and make it more fair through a wide variety of economic and public policy reforms. The key is that a program like the National Individual Investment Program isn't dependent on any of that taking place. It doesn't require a revolution; it doesn't require re-envisioning the economy from the ground up. Once implemented, the program could easily evolve over time through adjustments to the level of the tax that funds the program and adjustments to the number of hours worked to receive full time benefits. If and when an increasing share of national incomes goes to capital and demand for human labor decreases, the number of working hours required to receive full time benefits can be reduced, allowing for increased capital income as demand for labor declines. Furthermore, the implementation of a program like the one I am proposing here would, I believe, make other economic reforms more likely to happen in the future, because a result of this program would be greater economic enfranchisement of the majority of the population and a decrease in the concentration of capital ownership. It would, as Thomas Jefferson understood long ago, strengthen democracy by distributing political power via the distribution of capital ownership. As Jefferson understood, ownership is a major source of political power and when ownership is highly distributed so is political power. When ownership is concentrated so is political power. Thus, the first and most important mechanism for fostering democracy is distributing ownership of capital. That is exactly how and why American democracy was established in the first place, via the widespread distribution of capital ownership in the form of land. In this sense, the National Individual Investment Program is merely a 21st century version of the land distribution policies of early America, and nothing could be more American than that.